This workshop is very popular because Joyce Savitz of Jacksonville Yoga shares her experience from over 30 years of being involved in different movement therapies. A great way for massage therapists and yoga teachers to get 12 Live CEU’s>Come join our Yoga and Rolling Workshop to learn simple, foam rolling techniques to help reduce muscle fatigue and soreness; reducing aches and pains by improving blood flow and hydrating the connective tissue. These foam rolling techniques, when properly performed will rehydrate the connective tissue which will restore muscular and joint function.When: Saturday and Sunday, March 23rd and 24th, 2019Where: Jacksonville Yoga 391 3rd Avenue South Jacksonville Beach, FL 3225 Our Yoga and Rolling Workshop will be beneficial for Massage Therapists, Yoga Teachers, and their clients. These techniques will help you feel better PLUS Massage Class Schedule: - 1:30-4:30 pm - - - Neck, Head, Arms, Elbows, Hands Cost of this 2 day Workshop is $250 per person until March 1st. Workshop fee after March 1st is $300 per person.This healthy Workshop is based on our refreshing and rewarding Rehydrate, Roll and Yoga series. 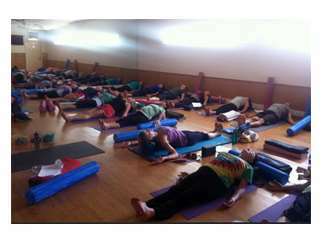 Read more about this series on our website: https://www.jacksonville yoga.com/rehydrate/rehydrate-roll-and-yoga Jacksonville Yoga's Joyce Savitz is a Certified Yoga Instructor and Licensed Massage Therapist, helping people in our Jacksonville community to look and feel better since 1976.- - Cost of this 2 day Workshop is $250 per person until March 1st. Workshop fee after March 1st is $300 per person. Class size is limited to 30 people. Call or Text Joyce at 904-635-6762 to enroll over the phone before this Workshop fills up!